Honey, I Flavored the Almonds! 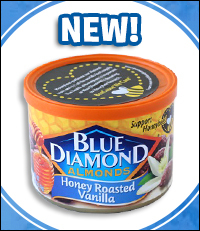 Blue Diamond Flavored Honey Roasted Almonds - You may be thinking, "HG, I've had honey-roasted almonds before." But you haven't had 'em like this! Check out the Vanilla, Cinnamon, and Chipotle varieties. We're OBSESSED, especially with the Vanilla ones -- they taste like they were dipped in French vanilla ice cream! A 1-oz. serving (about 28 nuts) has 160 calories, 13g fat, 45 - 105mg sodium, 9g carbs, 2 - 3g fiber, 5 - 6g sugars, and 5g protein (PointsPlus® value 5*). HG tip: Portion 'em out into single-serve bags. Available at select supermarket and drugstore chains. New Flavors! Fruttare Bars - Frozen fruit bars make hot weather better, and the bars by Fruttare are some of the best. Joining the lineup? Pineapple and Mixed Berry & Milk! Each Pineapple bar has just 60 calories, 15g carbs, and 11g sugars (PointsPlus® value 2*); the Mixed Berry & Milk bars each have 110 calories, 3g fat, 45mg sodium, 20g carbs, 0g fiber, 16g sugars, and 1g protein (PointsPlus® value 3*). In freezer cases nationwide... and in the HG freezer at all times! Kettle Brand Real Sliced Potatoes Baked Potato Chips - This new line has replaced the beloved Kettle Bakes, and it rocks! In Olive Oil, Sea Salt, Sea Salt + Vinegar, Cheddar + Roasted Tomato, and Hickory Honey BBQ, each 1-oz. serving (about 20 chips) has 120 calories, 3 - 3.5g fat, 135 - 160mg sodium, 20 - 21g carbs, 2g fiber, 0 - 1g sugars, and 2 - 3g protein (PointsPlus® value 3*). So many flavors, so little time... In stores everywhere. At TCBY… Silk Coconut joins Silk Almond in the nondairy, soft-serve fro-yo lineup! A 4-oz. serving (1/2 cup) has just 110 calories and 1.5g fat, plus 5g fiber (PointsPlus® value 3*). And as part of the TCBY World of Fro-Yo promotion, special flavors of the standard frozen yogurt are showing up every few weeks. We tried 'em all and are especially nuts about the German Lebkuchen -- a gingerbread-like treat -- available June 19 through July 2nd. At Starbucks... Wanna indulge in the latest from the 'Bucks in the comfort of your own home? Pick up a bag of the summery new Brezza Blend, and whip up an iced coffee! The light-bodied brew is described as "lively and juicy." Neat-o! At Dunkin' Donuts… There's a new DDSMART sandwich on the menu, and it's not for breakfast! The Grilled Chicken Flatbread Sandwich features grilled chicken, ancho chipotle sauce, and reduced-fat cheddar cheese on a multigrain flatbread. With 360 calories and 12g fat (PointsPlus® value 9*), you could certainly do worse -- Chicken Salad Wrap, we're looking at you. Summer Fun for Your Face! Huge news for lovers of fried food, natural ingredients, and low calorie counts... We've found an all-natural cereal perfect for making HG faux-frys! It's Nature's Path Organic SmartBran cereal, and a half-cup serving has 80 calories, 1g fat, and 13g fiber (PointsPlus® value 2*). We tried it out, and the results were very impressive. ***In even more natural-foods news, Panera Bread has announced plans to remove all artificial ingredients and preservatives from its food by the end of 2016. That includes high-fructose corn syrup, nitrites in deli meats, and more. Way to go, Panera! ***What's your fitness personality? Take this fun quiz, courtesy of HG partner About.com Health! Are you a free spirit? A seeker? Find out... ***If you love bacon, avoid pork, and aren't nuts about turkey bacon, here's a new alternative -- Schmacon! It's made from beef, and has just 30 calories and 1.5g fat per serving. Schmancy. Word is it'll be in stores this year, and we'll be ready. ***Finally, if having a Starbucks on just about every corner isn't enough for you, there's now a Starbucks Frappuccino Truck. The truck is currently making the rounds in Los Angeles, after starting out in San Diego. Our reco? Flag it down, and grab a Mocha Frappuccino Light -- a grande has just 130 calories and 0.5g fat (PointsPlus® value 3*). And that's all we've got. HG out! Share the food fun -- click "Send to a Friend" ASAP. The second week of June, a.k.a. now, is... National Email Week? You're celebrating already, and you didn't even know it!